Bonnie Schlachte, director of Ballet for All Kids, works with Liam Kay, 9, during class at the Los Angeles Ballet Academy. 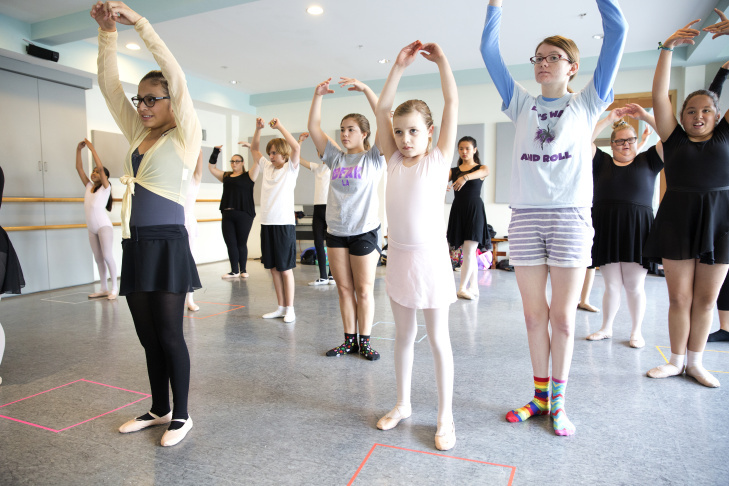 (L- R) Erika Veloz-Perez, 14; Elise Luna, 9, and volunteer Kate Nations at Ballet for All Kids at Los Angeles Ballet Academy. 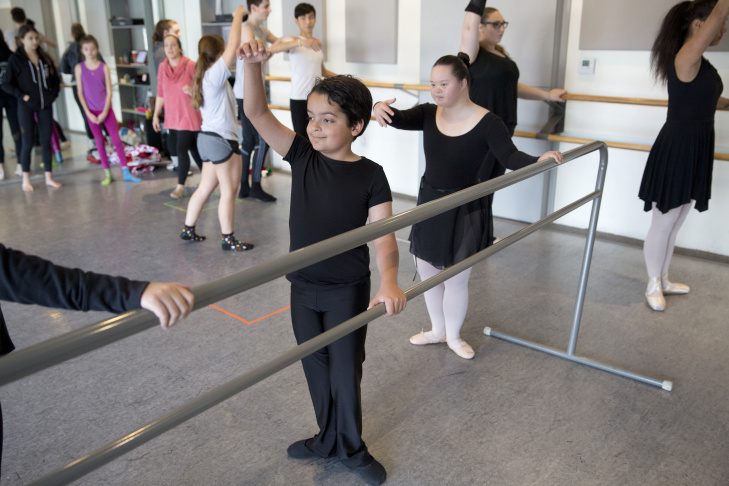 Liam Kay, 9, in a Ballet for All Kids class at Los Angeles Ballet Academy on Sunday Dec. 20, 2015. Color-coded squares help students who have issues with spatial awareness. Volunteer Serena Ajemian works with Samantha Mora, 4. Hannah Wirth, 5, dances in a Ballet for All Kids class at Los Angeles Ballet Academy. Bonnie Schlachte, director of Ballet for All Kids, with Jordan Wall, 17. At the start of Bonnie Schlachte's ballet classes, she leads a series of barre exercises. "Alright, feet in first!" Schlachte shouted as she walked around the studio on a recent Sunday, coaching students through pliés, relevés and the five basic positions. "Let's do posture!" It may sound like a typical ballet class, but there's more going on. "Come into my class and you have these kids in wheelchairs and you have these kids that don’t look like typical kids, but here they are doing the same things," said Schlachte. "There’s just a really rare beauty in that." 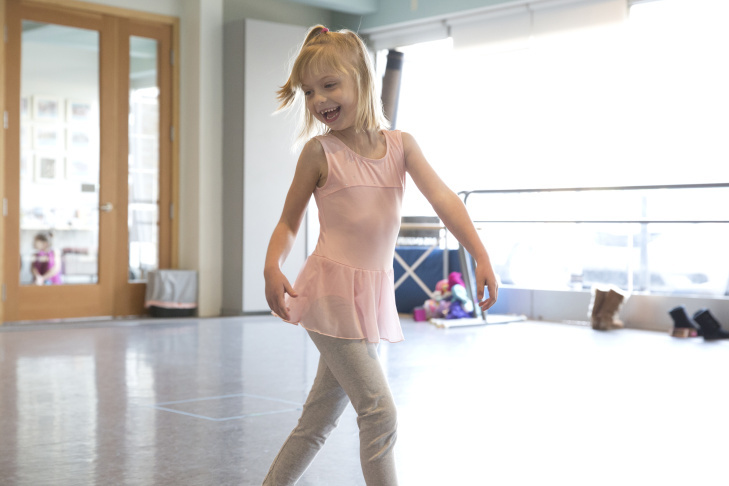 In her class, dancers have autism, cerebral palsy, Down Syndrome and other developmental disorders. She’s also had students who are blind, deaf, or in wheelchairs. 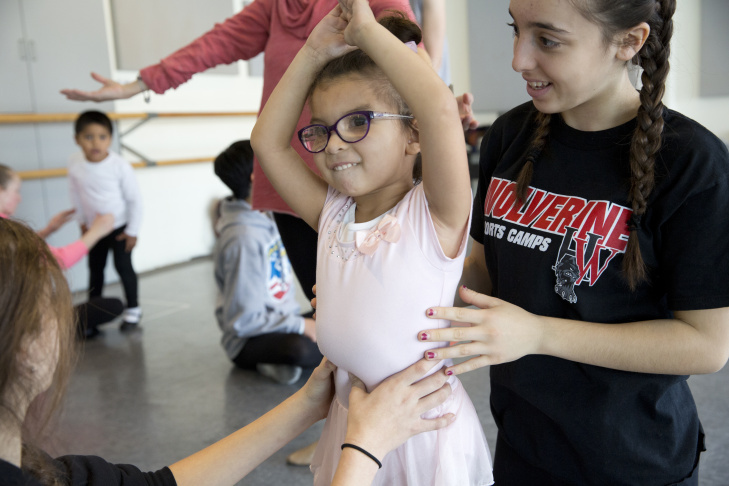 That’s why she calls her program Ballet for All Kids: the goal is to remove the barriers to access that kids with disabilities often face in pursuing activities like dance. 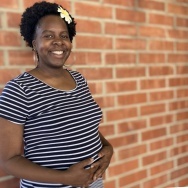 "If there’s ever a kid out there -- I don’t care where they are -- and they want to learn ballet, they should be able to go to a class and learn it," she said. Nine-year-old Liam Kay is one of those kids. When he was in kindergarten, he saw "The Nutcracker" and told his mom Jamie that he wanted to learn to be a dancer. "I started to research and couldn’t find a lot," Jamie said. "I knew he couldn’t go into a regular dance studio." That's because Liam has autism. He has trouble with anxiety, focus and social interactions. His mom found out about Ballet for All Kids at an autism walk and enrolled right away. Now, after four years in these classes, Liam is flourishing. He just got the part of Peter in "Peter and the Wolf." His class is working on the production for a recital in May. This is ballet for all kids, so typical children enroll, as well. Classes are held at dance studios in Encino and Westlake Village. Schlachte, 46, says most parents who enroll their kids have been searching for a class like hers for a long time. "Because they tried a regular class, they got kicked out of it, the teacher didn’t know how to handle them, they were overwhelmed," she said. Ms. Bonnie, as the students call her, can handle dance students that other teachers can't because she has an unusual combination of training. She studied classical ballet through college. But she also majored in psychology and has been working professionally with kids and adults with special needs ever since. In 2008, she decided to fuse her two passions together and start this program. "It was a total synthesis. It was a total, like, 'ah, lovely, yes' " moment, she said. She teaches classical ballet -- just like most classes for children -- but modifies instruction so that any kid can learn the technique. 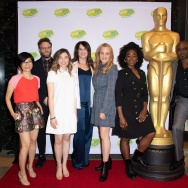 "When you have a child with special needs, you do a lot of therapy, you do a lot of specialized diets, you do a lot of special things for your special needs child," Schlachte said. "But what’s so nice is, here they just come to ballet. It’s just ballet class." Volunteer Lesley Coe leads warmups during class. If a student has hard time understanding cues, a volunteer will work to demonstrate or guide the movement. Color-coded squares on the floor help kids who have issues with spatial awareness. To help auditory learners, she uses music and sings commands. She keeps class sizes small. Another key component of her method is patience. Periodically, a child with autism, new to the class has a breakdown, but this is familiar territory for her. She's able to calm the child and get the class moving within 30 seconds. This class also works because Schlachte has an army of volunteers -- often enough to work one-on-one with each child in class. Most of them are high school dancers who started off trying to rack up community service hours. 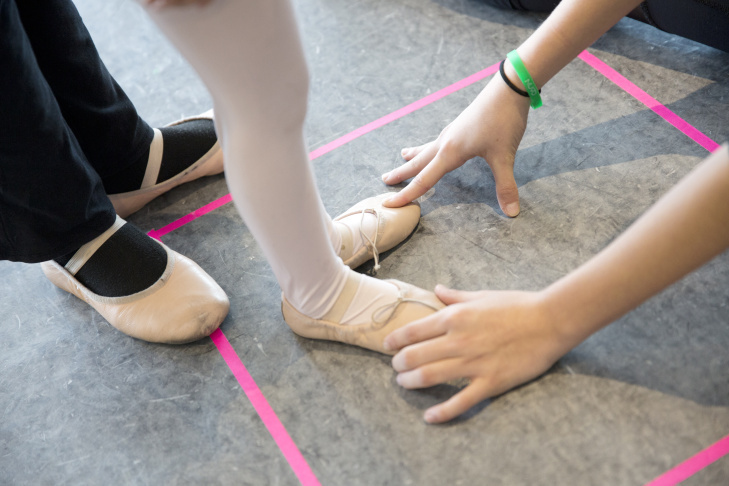 "It starts that way for a lot of kids," said Lesley Coe, a high school senior who trains at the Los Angeles Ballet Academy and has been volunteering with Schlachte for nearly four years. "And it ends like my situation for a lot of kids. They just fall in love with it and keep going with it. Nobody in that room is really recording hours anymore. It’s just not about the hours." Schlachte now trains volunteers so that they can teach classes wherever they go to college. Last year, a former volunteer started classes in New York. 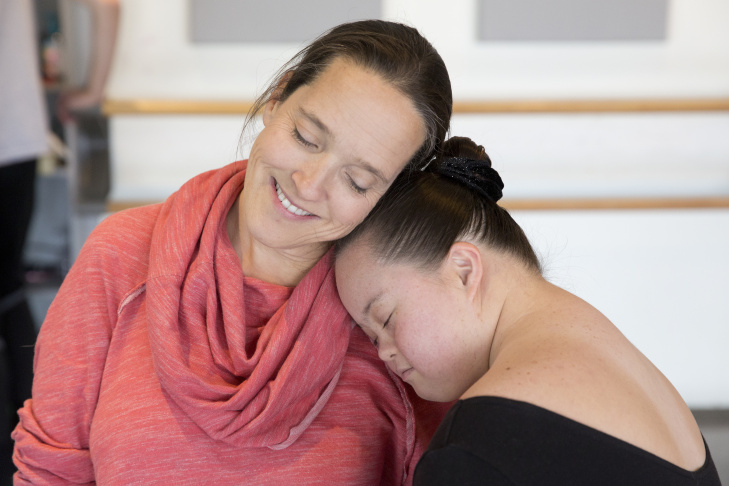 Director of Ballet for All Kids Bonnie Schlachte with Sarah Hansen. Hundreds of kids have come through the program in the past seven years. Sarah Hansen, 17, has taken classes since the beginning. She has peripheral neuropathy, a nerve disorder that disrupts messages between the brain and spinal cord and the rest of the body. Just walking is a big challenge. "Before I came I could barely walk across the room," Hansen said. She often holds onto a volunteer or sits in a chair during classes. But during a recent recital she said, "There was a point where I actually went out on my own and walked across the stage and that was really nice." She performed that dance routine back at her high school. She said that was nerve-racking, but fun. "Yeah I dance like this, it’s a little different than all of you guys," Hansen said, "but I like it so, I love it so."